Overall you get a nice trilogy of models that work well together; each in its own bag to construct one at a time. 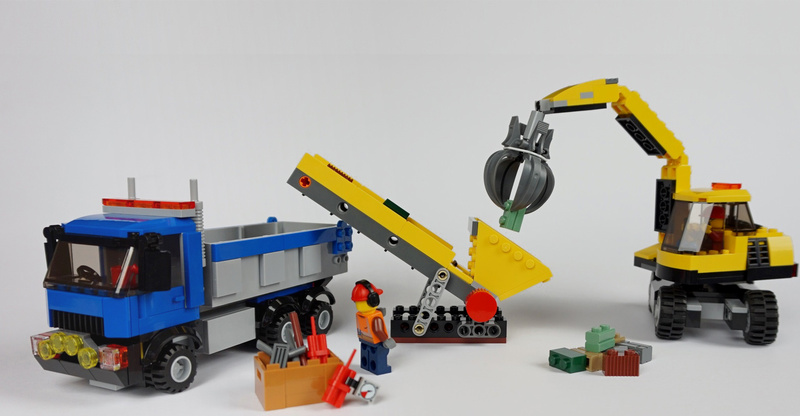 I think the play story is supposed to go something like this: workers blow up some old derelict brickwork, the crane picks up the debris and drops it onto the conveyor belt which loads it into the truck to be driven away and no doubt recycled. Why the conveyor belt is actually needed is not clear but it looks cool and works nicely. The six-wide truck is solid and looks like a lot of sets we have seen before. The rear tray can raise up and has a flap at the end which allows it to be emptied. The crane/excavator rotates on a four-wide clicking turntable and the arm is hinged three times - plus there's the grabber which I’ll talk more about below. There are some new and interesting pieces in this set. 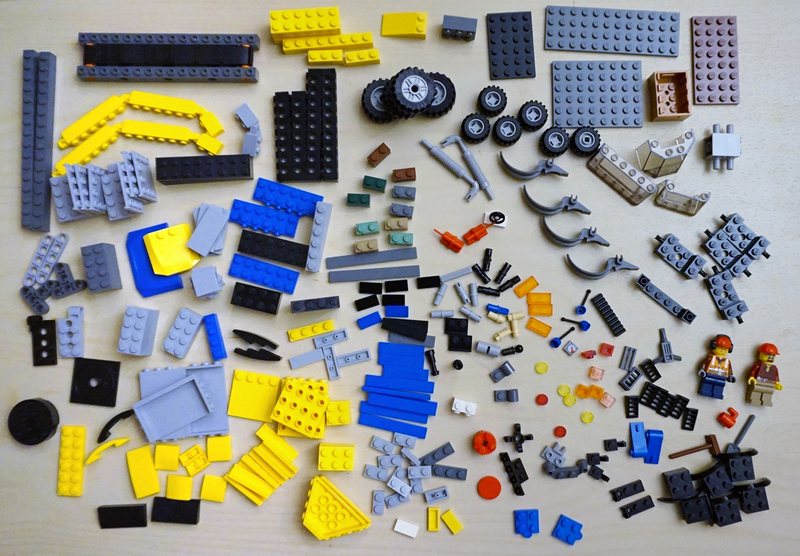 I’ve included a photo of all the pieces laid out as hopefully it will provide a good overall feel of the contents of the set. The most obviously interesting part of the model is the grabbing assembly on the crane. Four Dark Stone Grey [TLG]/Dark Bluish Gray [BL] fingers (Element ID 6097000 | Design ID 91347) are attached around a 4.8mm Technic pin hole with four clips (6052369 15646). An elastic band is used to spring them back together when opened and provide force to hold onto a brick. The fingers are exclusive in this colour and have only appeared once before, in Black, back in the 2010 Toy Story set 7596 Trash Compactor Escape. 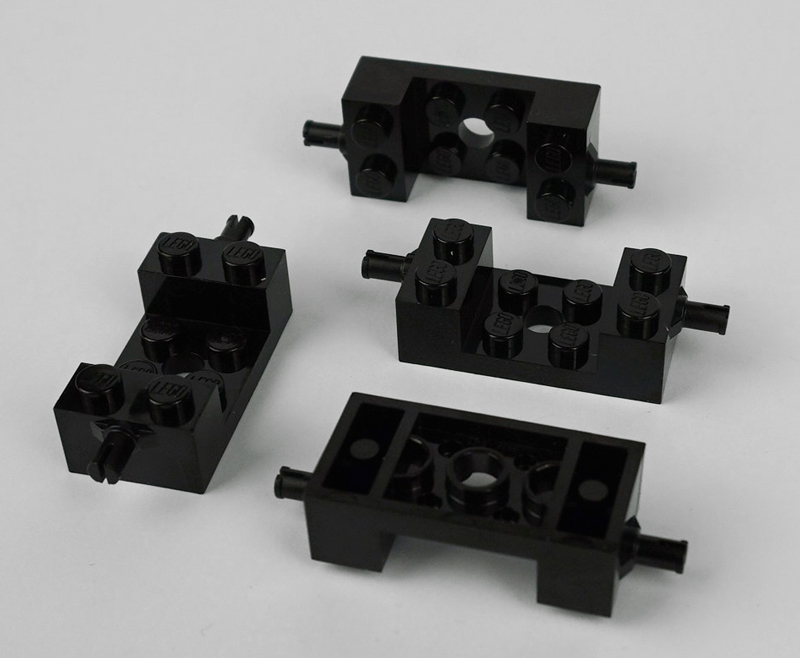 The four-clip piece that holds them together is not so rare, having been in twelve sets. There is a new way to attach wheels to a vehicle. 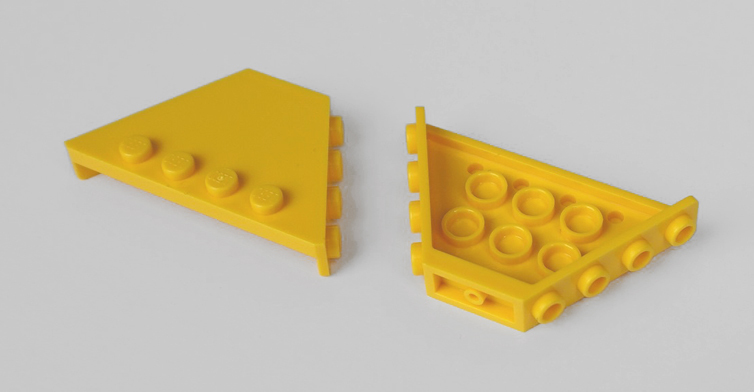 The 2x4x2 plate with mini pins (6097381 18892) is currently only a handful of 2015 sets including 41091 Mia's Roadster and 60082 Dune Buggy Trailer but I’m sure we will soon get sick of it. It seems a strange design as it drops in the middle so is obviously designed to have a plate connecting several together but connecting underneath may make them likely to being pulled off. In this set they are securely built in but children building their own creations don’t think like that. 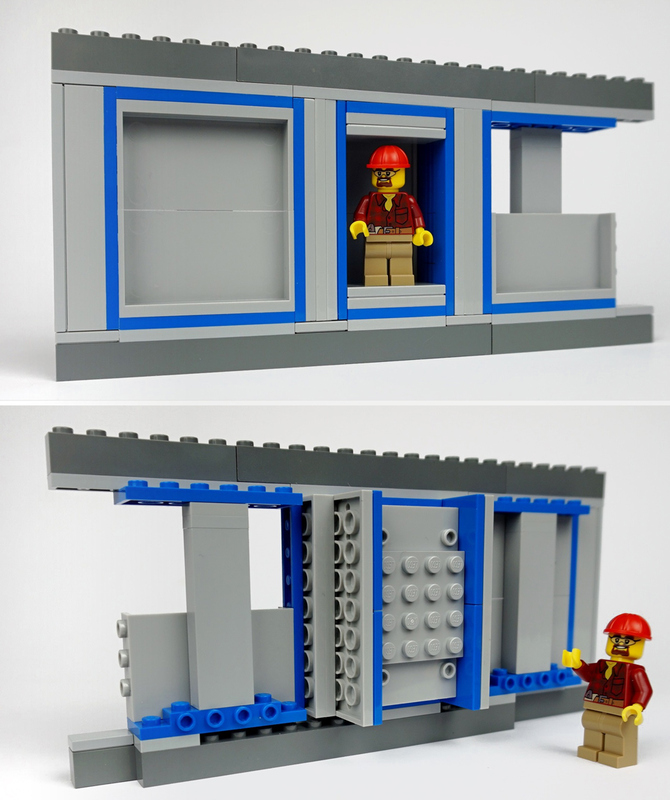 If you are trying to recreate the recent Shell promotion set 40195 Shell Station I have good news. 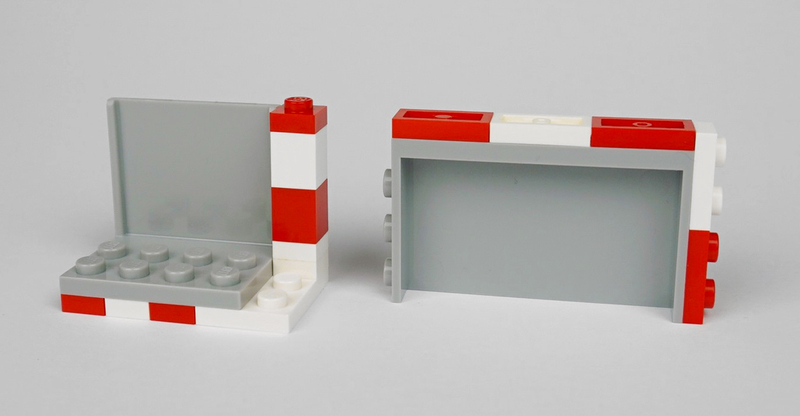 The 1x2 brick with 2 knobs in white (6058177 11211) that was only in that set is now available in this set as well, although there is only one here. 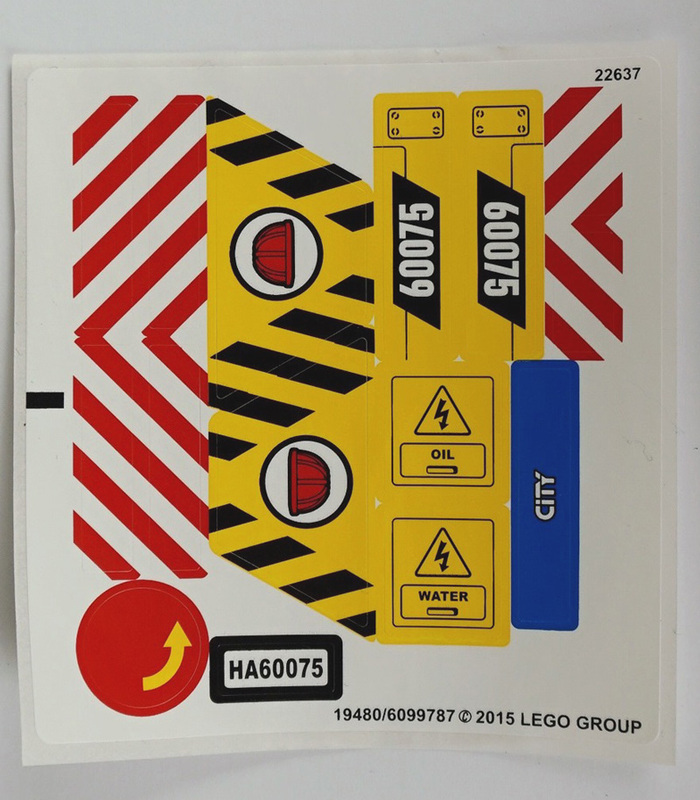 More news for Shell promo fans; 2x2 (6079007 15068) and 2x4 (6079001 93606) curved slopes in Bright Yellow [TLG]/Yellow [BL] are available in this standard run set for the first time; they have only been in the 40193 Ferrari 512 S before. I can’t help you with the stickers. Also included is a new piece of head gear which is currently exclusive. 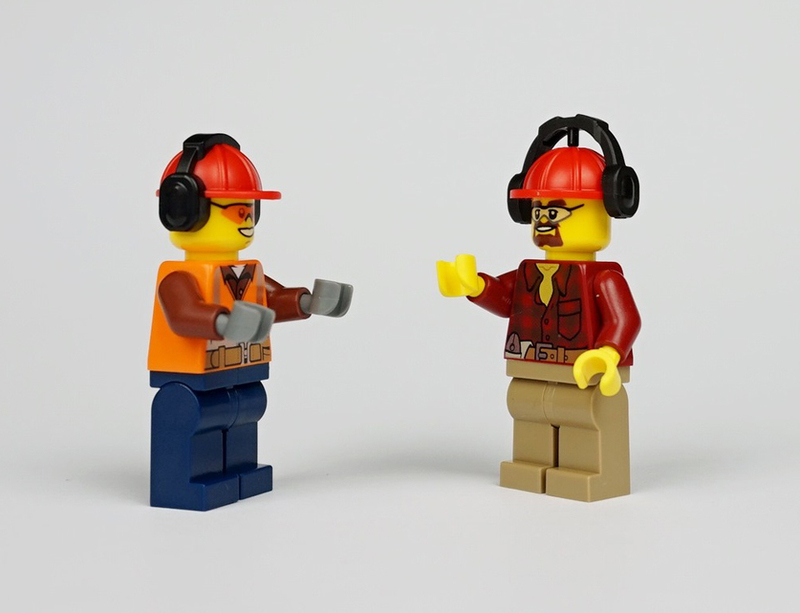 Effectively it is the classic red construction worker helmet with a pair of ear defenders as part of the mould (6100921 18899). 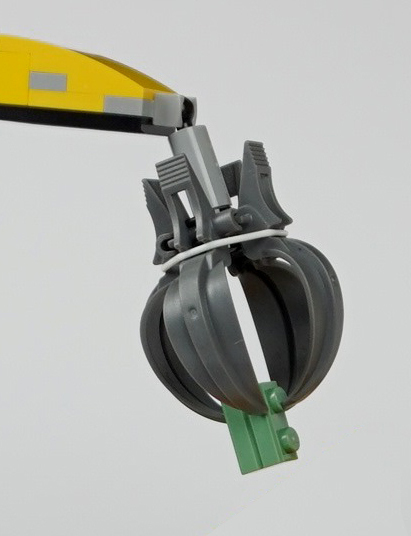 You might have expected last year’s separate ear defenders to do the job but LEGO have decided to make a new all-in-one piece. The new and old versions of the critical health and safety noise blockers do match very well though, as you can see in the picture. Feeling blue? 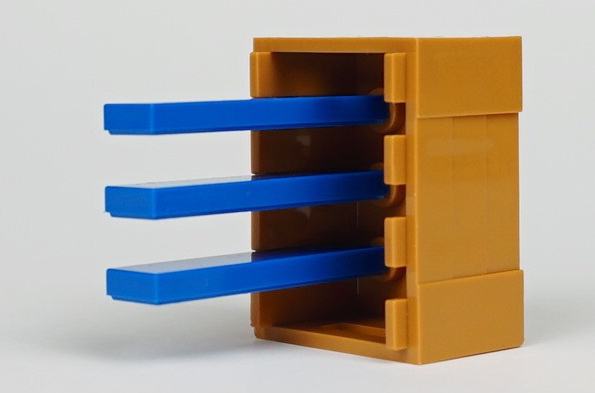 There are two exclusive 2x6x2/3 plates with 4 horizontal knobs (6102539 87609) in Bright Blue [TLG]/Blue [BL]. There are also a couple of Transparent [TLG]/Trans-Clear [BL] 1x1 tiles (6047501 30039) enclosed. 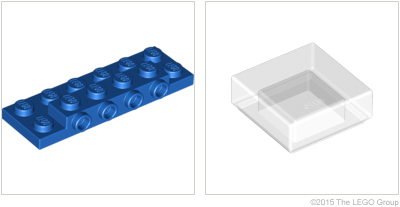 These are rare in sets being in only two difficult-to-get-hold-of LEGO promo sets and 21020 Trevi Fountain, but for some reason Bricklink is awash with them for about £0.50 each. Whilst not rare I’ve never got hold of the conveyor belt (4597139 92712) before and as it arrives in the set as a pre-assembled item, I could not resist exploring it a little. No LEGO bricks were damaged for the above picture but I did have to strain a little to get the orange piece out. Most interestingly there are four panels that run between the main beams; these are smooth on both sides and exactly a tile/plate below the beams with the space between a perfect fit for a 1x2 plate as you can see from the yellow and blue parts that I added. So even though the ‘inside’ was designed not to be interacted with, the measurements are completely in System. Don’t worry, it’s all back together now. The crate also revealed a little trick to me. You can slide a tile or plate between the vertical spaces along the edges of the rim and they happily sit there. This makes sense really when you think about how two 2x3 plates can be used as a crate lid. Next we have a special feature on panels. There are three types of panels with interesting SNOT possibilities in this set. The angled Yellow ‘end piece for truck body’ (6065756 30022) is another old piece (1996-2000) which has been brought back to life. 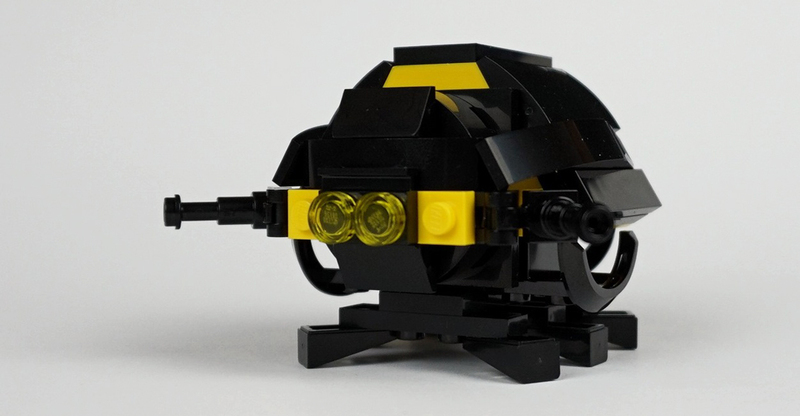 I didn’t fully explore the possibilities which the angled side studs allow but I did put together a quick Blacktron alternative model using the two from the set as a starting point. Next we have a couple of related Medium Stone Grey [TLG]/Light Bluish Gray [BL] pieces (4646525 98287 and 4648115 98280) which can be hard to get hold of in bulk. The picture below shows (in white and red) their sizes and what some the side studs allow. I’ve built them into the wall below to expand on this and show the interesting SNOT that they allow. They are certainly pieces I want to explore more in the future. Before I sign off there are just two more observations I would like to share. Firstly, does anyone proof-read sticker sheets at LEGO? I’m sure someone does but they don’t seem to have had a problem with placing an electrical warning directly above ‘Water’. The second is to congratulate and thank LEGO for three great advert scenes at the back of the instructions. 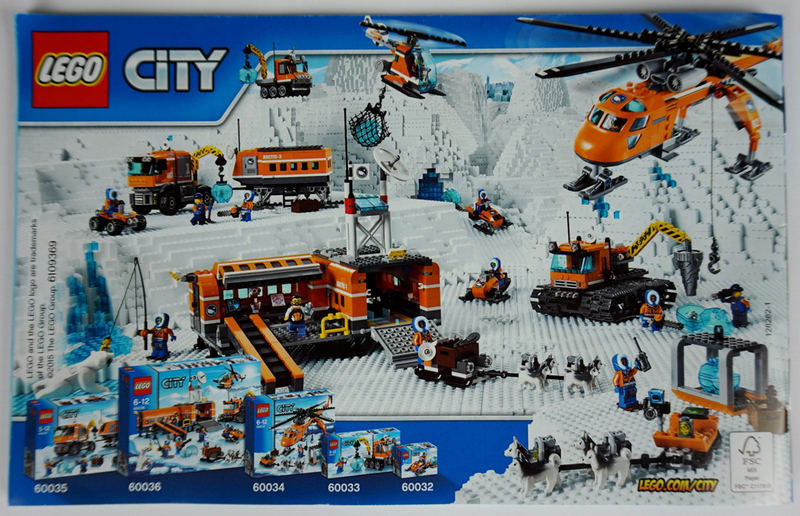 There is a City police one, a City trains one and a polar expedition one (below). These are reminiscent to me of catalogues of old: proper brick-built backgrounds and landscaping, a sense of fun and minimal computer trickery. Keep up the good work LEGO! 60075 Excavator and Truck retails at £34.99 / US$49.99 / €39.99. Consider using our affiliate links to buy it (or anything); this helps support New Elementary! Nice set, nice and detailed review. Overpriced in US by about $20. Pass. 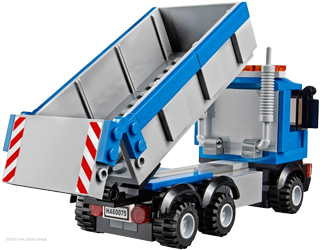 This appears to be the new iteration of one of my modern day favorites; 4434 Dump Truck from 2012. I don't however, believe this an improvement. The 60075 truck isn't quite as near perfect as 4434 and, despite the extra vehicle and conveyor, I will never consider paying $50 for this. There is no wheel that attaches to the minipin that looks proportional to these trucks and the way they typically stick out half a stud past the mudguard on city cars is irksome. I'm hoping for one or two new wheel and tire molds, designed specifically for TLG's current city vehicle scale, rather than keep using those meant for 4 stud wide vehicles. This tire fits the same rims that you seem to be complaining about, and looks more realistic on, say, a semi truck. And here's a rim/tire pair that just came out in 2013 (and hasn't seen near enough use) that fits the same pin connection, is narrow enough to not stick out past the fenders, and offers a tire style that looks like it could be a high-performace street tire (where the sidewall on the tire might be only about 1-2" beyond the edge of the rim). There are also cheats you can do, by combining rims and tires that were never really meant to go together, if it gets you the look you want. Personally, I don't really understand the whole idea of making custom buildings and then using stock models for all the cars (particularly when you're using enclosed roller skates, like Small Car). Then again, custom car models is most of what I've built to display on our club layouts. My little brother got this set for Christmas and was absolutely thrilled. I was thrilled with the parts selection... but not so much the Canadian price tag. And thanks for pointing out the Classic Space influence on the truck; even having an open Exo-Suit in front of me I missed that. The two-pin version of ‘end piece for truck body’ is even older, having appeared from 1969 to 1982. Heh, so it's overpriced everywere, not only in Poland.